Maybe this is of little interest for my foreign readers, but if you’re in Italy during these days, and your tourist-ing around and you’d like to take home some souvenirs, or get ahead with Christmas presents, or just want to do something different, and fun, and treat yourself, this yearly artisan craft fair is what you need. Plus the entrance is free, so it’s a win win. 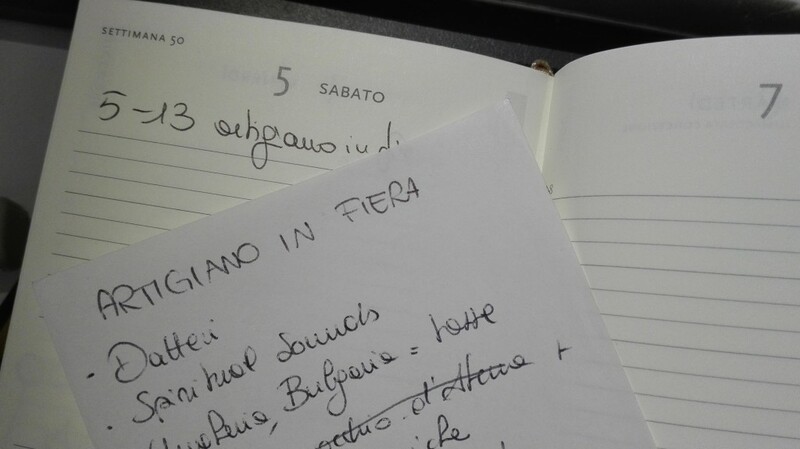 I’ve been keeping this note in my diary since last year’s Artigiano in Fiera. It’s a list of stands to visit. Why am I telling you this? Because it began yesterday and will end the 13th, because last week they were looking for volounteer bloggers to talk about this and I did, and because it’s barely started and I already have three places to add to my list. Basically, this is my typical visit: get there in the morning, have a second hobbit-breakfast (usually Neatherlands or France), visit around, have something fancy to eat (usually Asia), go listen to Saor Patrol (Scotland), visit around some more, get all Christmas presents in a day and, when your feet are totally done, go home with your loot. Can I ask everyone a favor? Can I ask you all people with trolleys (even though this is brilliant!) to be aware of where your trolley is, at all times? I’m asking because it usually goes like this: we are all standing with our nose up in the air, gazing at everything marvellous around us, then with a glimpse from the corner of my eyes I spot an opening between people, hoping to pass there to move to the next stand. And each and every time I’m blocked or tripped by trolleys standing three feet from the body of their owner. I’m simply asking to keep a tighter “leash”. In exchange for that I’ll apologize in advance for the blows my backpack will cause you, and hereby promise to be more careful with that! My targets are: Japan, because I can never get enough, Middle East for pottery, dates and bags, France for lavender and Fuori Tempo jewels, Hungary and Bulgary because a friend recommended them last year and I’ve been curious since. “LunArt Terracotta” (I’m a fan over FB so finally I’ll be able to see her works in person) and for Fritlex who peaked my interest over Instagram with pictures of their Burton and Alice in Wonderland inspired creations. If you have any suggestions, I’m here to hear them! I’m planning a visit on the 11th, so you have plenty of time to fill me in with what I don’t want to miss! If, instead, you’re still unsure on what to do here’s Artimondo youtube channel, with storytelling videos that might convince you to go, or if you really cannot go there, here’s the online shop and the magazine ! Those pictures are from last year’s visit, yes, it looks that cool. And yes, this reminds me I need to look for smoked paprika.